Putting together an amazing race party can be complicated. You need to come up with pit stop ideas and challenges. You need to create teams and organize routes. It can definitely be overwhelming. 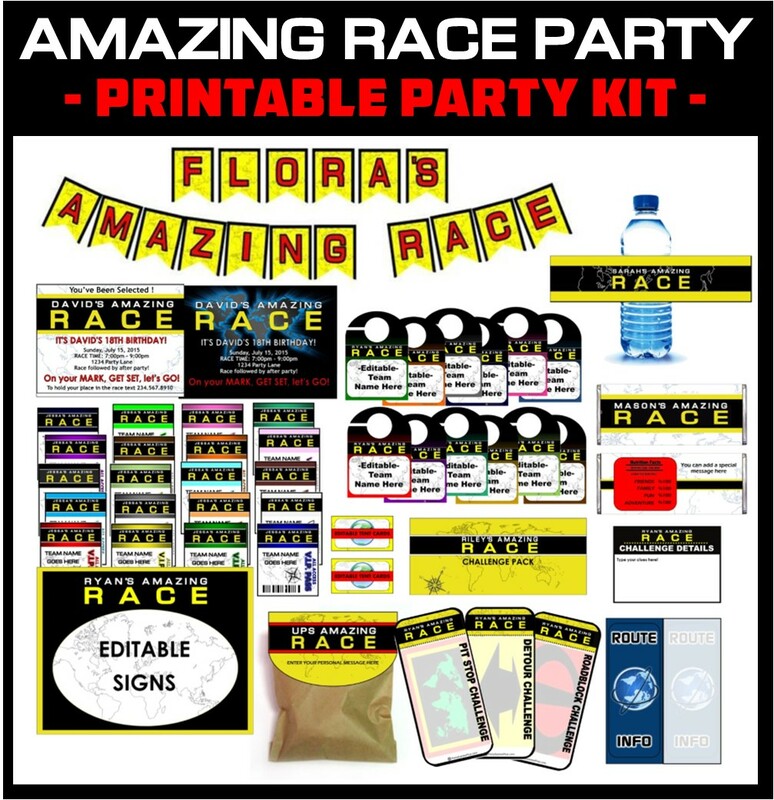 Hopefully with the Amazing Race party ideas page and the printable party supplies below you will feel much more confident putting your party together. This party printable set is one of out most popular, and now it's even better because you can personalized everything yourself with our editable PDF files. Plus, it now comes in a INSTANT DOWNLOAD! Invitations - Choose from 2 designs - fully editable for your party details. Badges & Car Tags Editable 20 colors to choose from, or use them all! Team names are now editable so teams can choose their own! 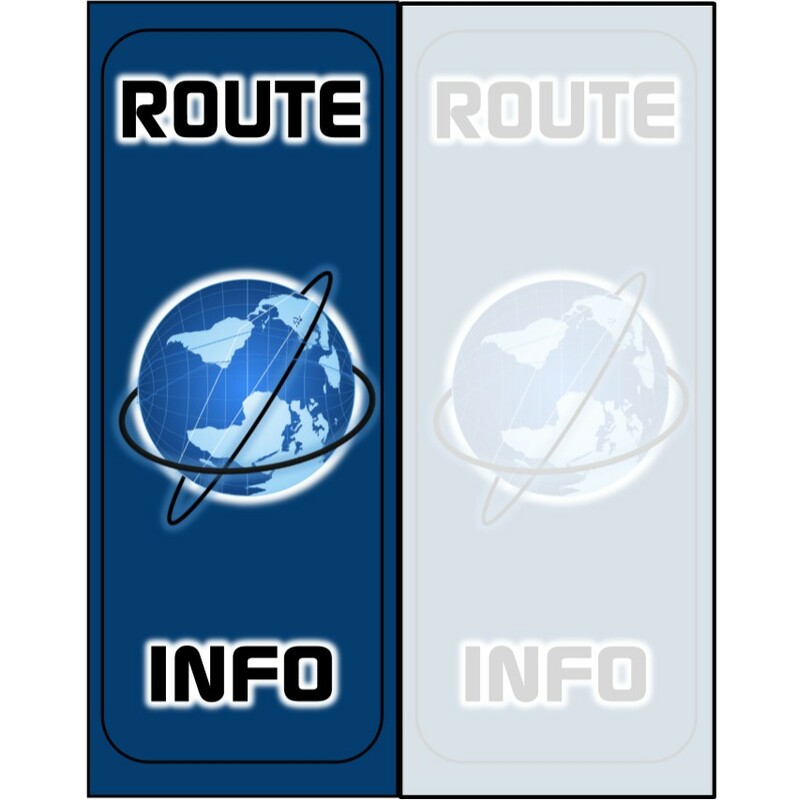 Challenge Cards Editable Pit stop, road blocks, detours, and route info cards. 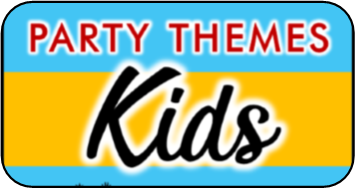 OUR PARTY PRINTABLES ARE THE ONLY ONE'S YOU WILL FIND THAT OFFER THE VERSATILITY TO FIT YOUR CREATIVE TITLES! 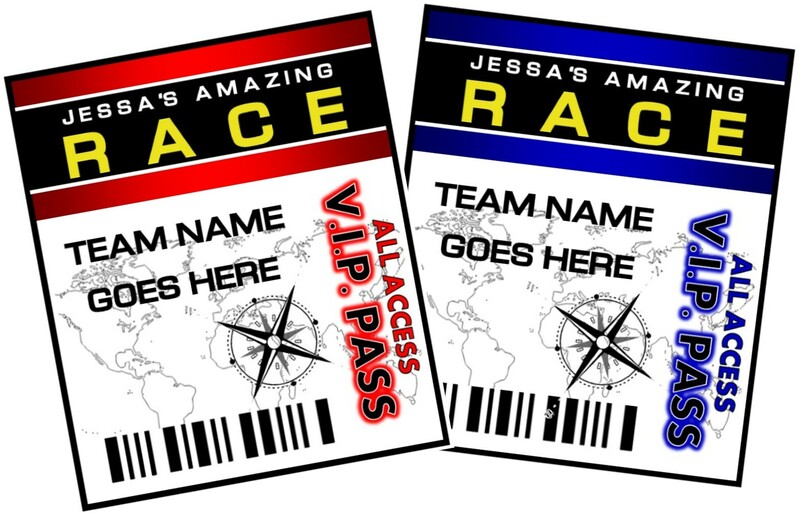 get your amazing race party printables now! 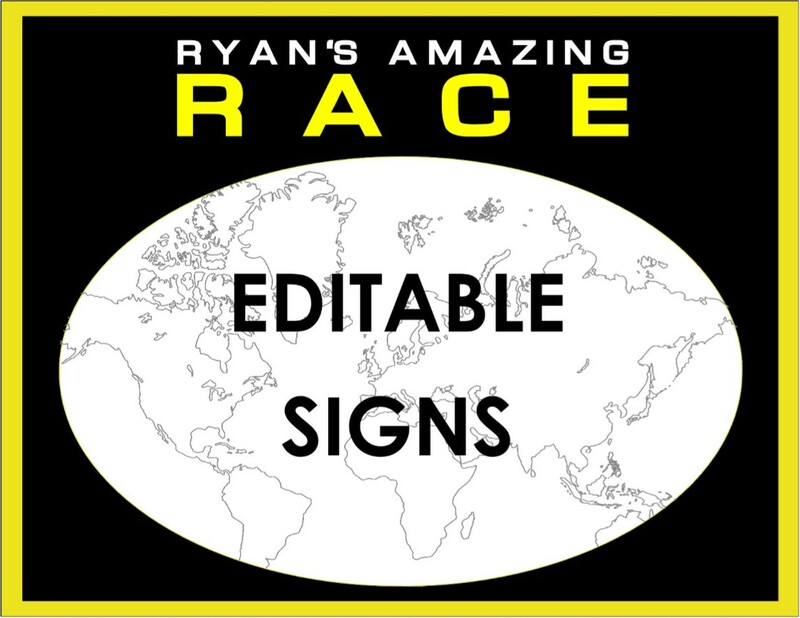 To order your printable Amazing Race party supplies you will first need to select how many letters are in your TITLE. To determine this you simply count how many letters are used in your title NOT including the words AMAZING RACE. For example if your title is going to be SARAH'S AMAZING RACE. Then the letter count for your title would be 6. Once you choose a Title number then the printables will automatically be placed in your cart. If you are ready to check out choose VIEW CART and you can complete your purchase. if you don't need the whole set we make it simple for you to purchase items A LA CARTE! 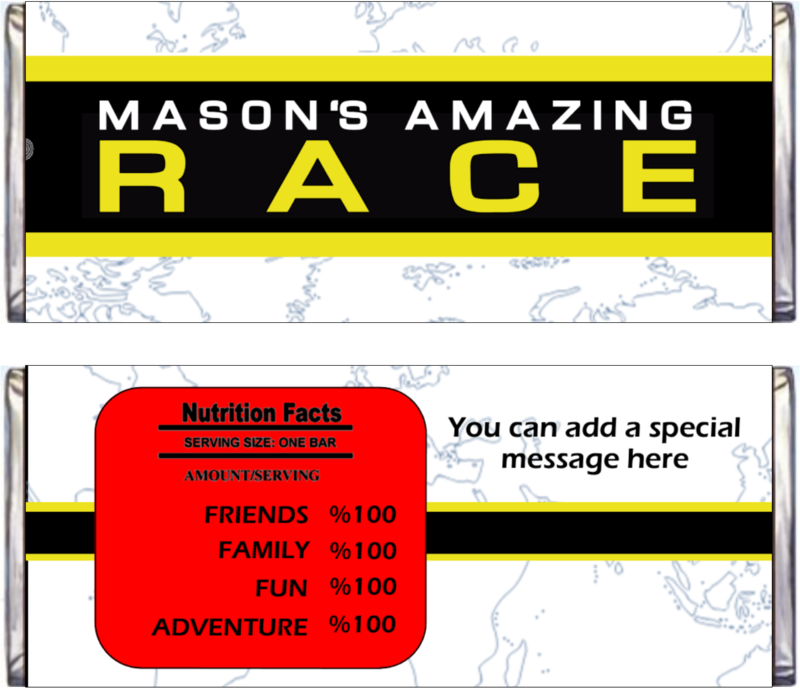 Choose from three fun Amazing Race party invitations. These high resolution invitations measure 5x7 and come two per page. You can easily personalize the details using adobe reader. Simply open the file in adobe reader - click on the text you want to change - then type in your desired text to replace it. Once done you are ready to print! One of the great advantages of printable invitations is that once you have the file you can print out as many as you need. You can print them out on your home printer, at your local print shop like Staples, or your favorite online print site. These personalized badges are a fun way to identify and unify the teams. Attach a lanyard or colored ribbon to each badge and assign to colors to teams. These are delivered via email in an easy to edit, ready-to-print PDF file. These Badges come in the 20 team colors! Depending on your Amazing Race Challenges, they may involve driving around to different locations around town. Each team will be driving in a different car. These personalized car tags coordinate with the team badges and are a fun way to specify whose car goes with each team. Just print and cut them out and use them to hang from car’s rear-view mirror. Delivered in editable PDF file. Not all colors are shown - these car tags come in all the colors as the team badges. If you don't need car tags you can always cut off the top part and use this item as a team sign or t-shirt iron on decal. GET YOUR team badges & car tags NOW! 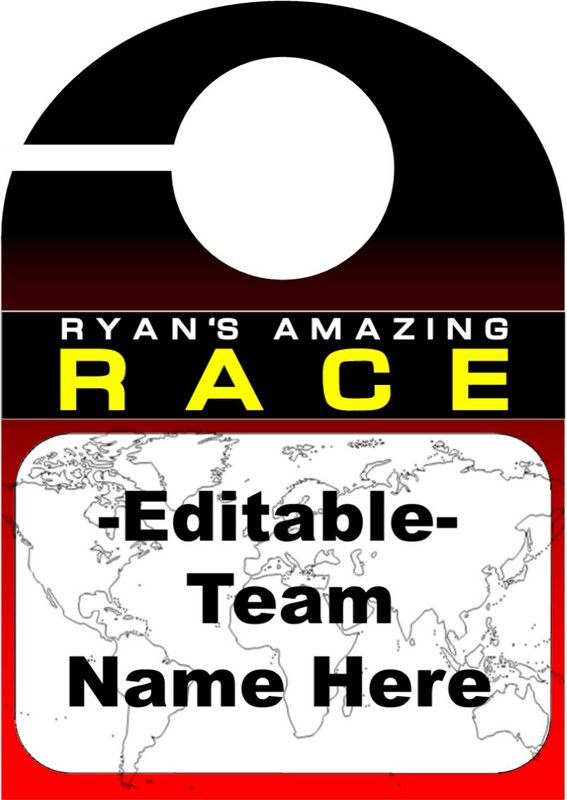 To order your printable Amazing Race Team Badges & Car Tags you will first need to select how many letters are in your TITLE. To determine this you simply count how many letters are used in your title NOT including the words AMAZING RACE. This is what The Amazing race is all about ~ The team challenges. Four different types of printable cards make it easy to organize your race. They include pit stop clues, road block challenges, detour challenge cards, and most recently included - editable Route Info card. Mix up your race by including all three challenge types or keep it simple with just one or two types of cards. 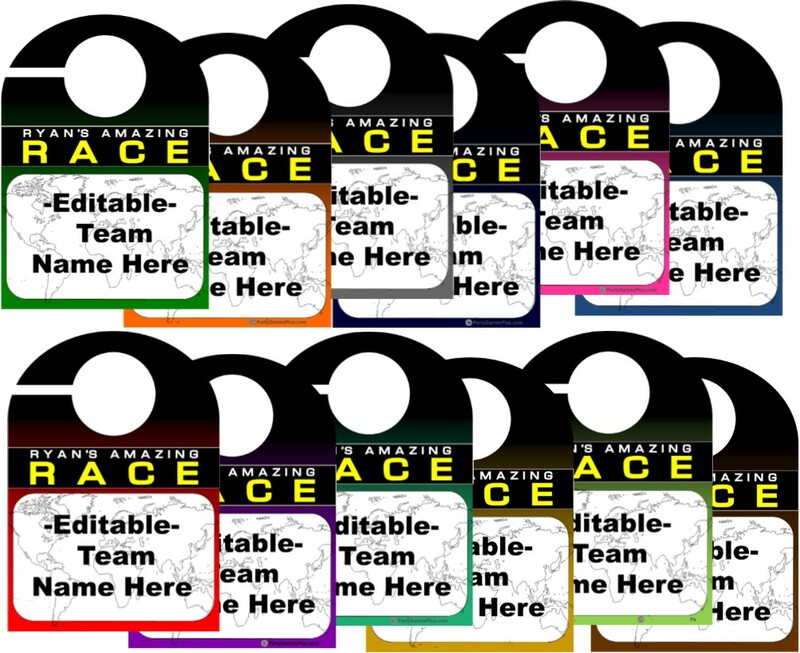 Print out as many as you need to create your perfect Amazing Race party. Perfect for printing out all your pit stop clues. These will be delivered in a editable PDF file. These NEW files are easy to type in your own clues and challenges. Just click in the given space and start typing. Once the team solves the challenge clues to discover where their next pit stop is located you can use these challenge cards to tell the teams exactly what the next challenge entails when the players arrive to the next destination. For examples check out my Amazing Race party ideas page. these also will be delivered to you in an editable PDF file. Need signs to lead the way, mark post, or something else you have in mind. These signs come ready to edit - Simply type in your message and Voila! 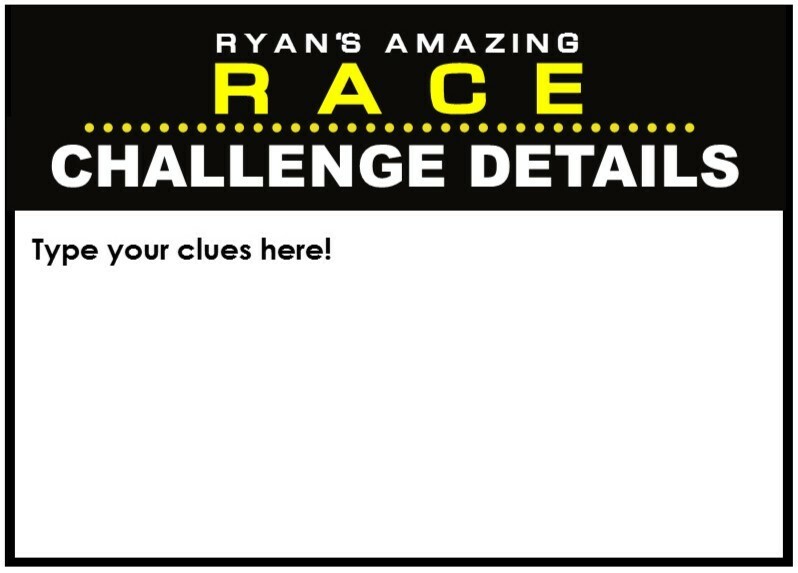 These can be printed on regular 8.5 x 11 printer paper and folded to form a number 10 envelope perfect for storing all the pit stop clues and details for each challenge. You are able to edit any and all of the text to any text that suits your needs. 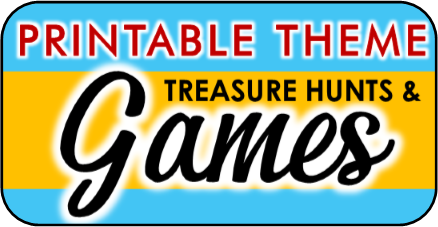 get your clues & challenges set now! To order your printable Amazing Race Clues & Challenge Set you will first need to select how many letters are in your TITLE. To determine this you simply count how many letters are used in your title NOT including the words AMAZING RACE. 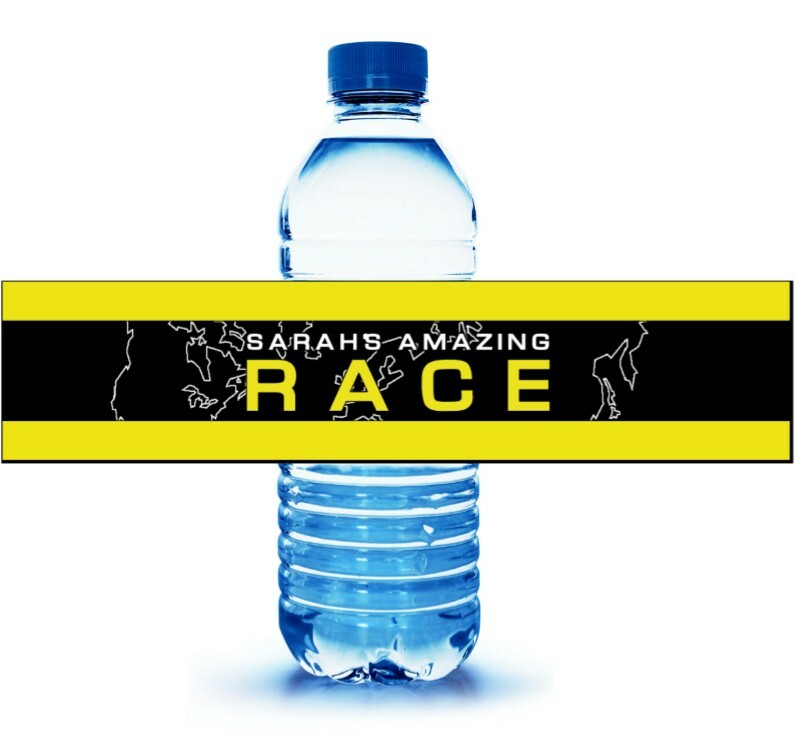 Keep with the theme and keep the contestants hydrated with these personalized Amazing Race water bottle labels! Print these fun water bottle labels out and use double sided tape to attach these to your standard sized water bottle. 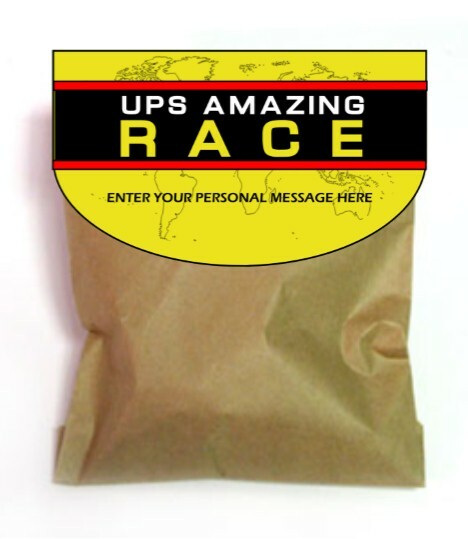 These cool favors make a great addition to your Amazing Race party supplies. These Come in a ready-to-print PDF file. These fun wrappers can turn any standard Hershey bar into a fun, personalized favor. Top image shows front of wrapper. Bottom image displays back. Everything is editable including the ingredients, fill with fun items such as family, fun, frinds, or adventure. If you are planning on goodie or favor bag give-a-way at the end of your party these personalized favor bag toppers make it easy to turn a regular lunch sack or cellophane bag into a fun treat bag. There is even a space to type your own thank you message. Perfect for the post-race feast! 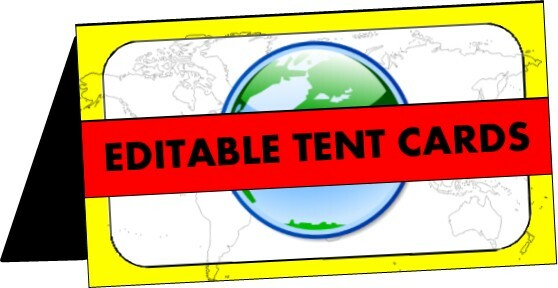 These editable tent cards can be used for your buffet, or as name tags. Whatever you want to type in them you can. Simply click on the default text and type in your own. get your favors & LABELS Now! 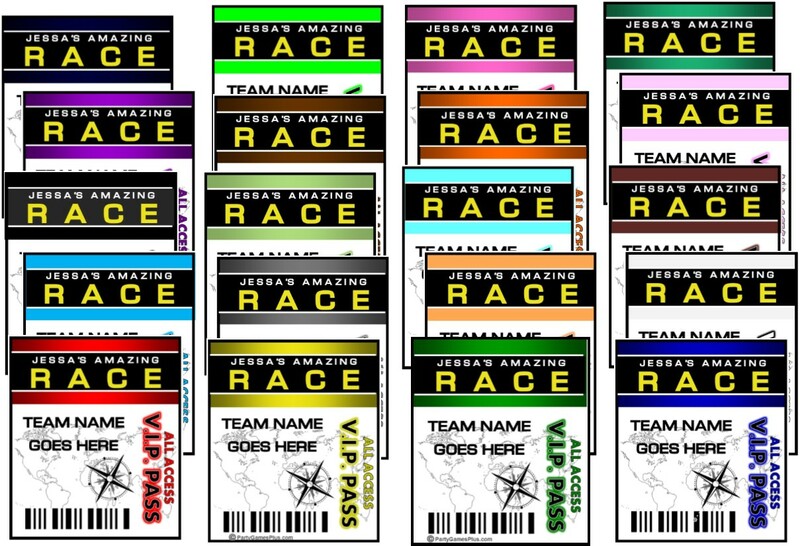 To order your printable Amazing Race Favors and Labels set you will first need to select how many letters are in your TITLE. To determine this you simply count how many letters are used in your title NOT including the words AMAZING RACE. Easy to print pennant banner. Comes with all letters and numbers -A-Z, 0-9, 'S, plus race flags to separate words and add a bit of flair. You print out the ones you need to create the banner with any wording you desire. Each letter is printed on 8.5 x 11 paper. get your amazing race party banner now!